Let me just wipe the dust off this old blog. Goodness. It's been a while. First things first, I have become addicted to Hawaii Five-O. Like ridiculously so. I blame the cold I got in February. It had me down for the count and laid up in bed. And...on a whim I just started watching the show. And now, I can't quit. I've watched almost all 6 seasons (IN A MONTH! )....and I'm starting to panic about what I'll do between finishing this season and the time until next season hits Netflix. And then the time between that and when the new season starts this fall. I may need to get a life. In possibly less depressing news, I've also REALLY got into putting together looks or inspiration boards on Photoshop. Mostly interior design stuff (we are finnnnnallllly moving this weekend)...but also some outfit inspiration. So fun, right? 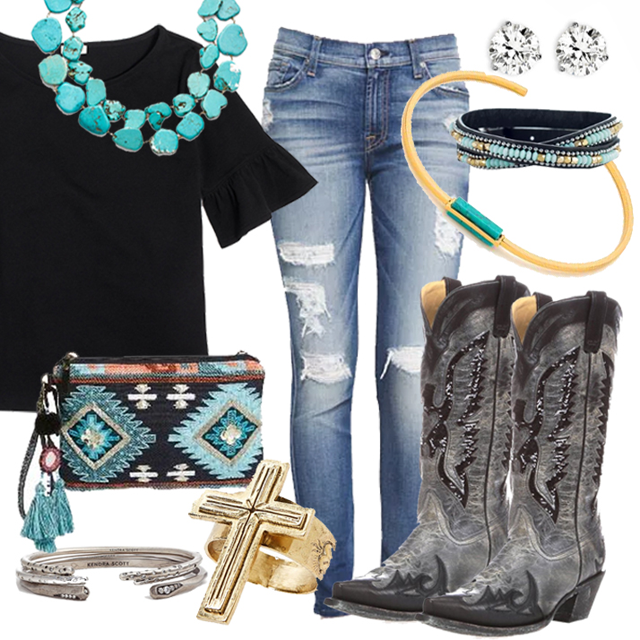 I love black and denim and turquoise. I think it's classic and timeless. And all the accessories and sparkly boots give it some sass. Y'all know I'm a sucker for cowboy boots. And the best thing about this is it could win me a free pair of boots!! King Ranch Saddle Shop is giving away a free pair of boots. All you have to do is share your favorite rodeo look on Instagram or Facebook and tag the photo #krrodeostyle by this Friday, March 31. Easy peasy! !